January appears to have got away from me. It’s been a most annoying month, with various parts of the house and car taking turns to fall to bits and I’ll be honest, generally make me feel like they’re conspiring against me. None of it has been particularly serious repairwork, but it’s all served to inculcate a general feeling of one step forward, two steps back. 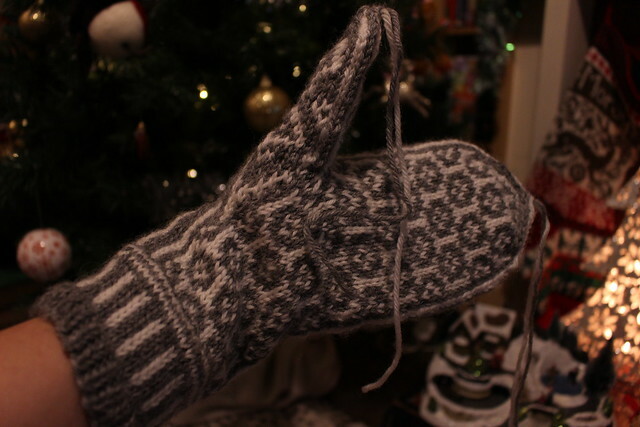 We did manage a visit to Derbyshire a couple of weeks ago and I’m glad to say I finally delivered my uncle’s gloves. They didn’t need any adjustment at all, and he seemed very happy with them – he’s been feeling the cold, and his old gloves were very much the worse for wear. Sadly what I didn’t do was take a photo of them before I handed them over! Maybe I’ll get a photo next time I see him. One of our ‘ups’ this month came early on, nicely counteracting the ‘down’ of my car being put out of action as the New Year turned (seized locks and snapped keys, rather than anything overly mechanical!). I’m making a return trip to The Capitol this year, the Doctor Who convention that I attended last year with my husband and which was our first foray into con-going. This time we’re bringing the whole clan with us, which will bring more firsts – not least, our first flight as a family. It’s only a short hop down from Glasgow, but it’ll serve as a very useful test run for potentially longer journeys. Needless to say, I’m pretty excited about the whole thing, and hopefully I’ll have properly finished that Season 12.5 scarf (with graft!). I’m also planning on casting on the Season 18 scarf when the Blu-ray arrives this month, though whether I’ll have that done by the end of April depends very much on whether I take on a lot of other knitting at the same time, I think – it’s a bit of a monster knit. The trouble with the door locks on my car started when the weather turned colder. We’ve not had a lot of snow, and it’s certainly not as cold here as it is in many parts of the US right now, but it’s certainly chilly. I’m itching to get back out in the garden, but after a day or two where the temperature was above freezing for a while, it’s returned to sub-zero temperatures. I’ve spent some time sorting through seeds and thinking about this year’s plans for the garden. The seemingly endless WIP that is my greenhouse is edging closer to becoming usable – I need to move some slabs under one side of it to level it up, bolt the whole thing down, and then I can start adding the polycarbonate sheeting that I’ve had in my possession for a good couple of years now. I’ve dusted off my gardening blog to spare any non-gardening knitters that might be reading from having to wade through photos of seeds and compost and whatnot, but if you’re interested, it’s over at https://greenhollow.wordpress.com/. When I started these, I remembered that way back when I knit the first pair, I muttered something on here about drafting the pattern up properly, so as a result I’ve a pdf on its way and which should be available fairly soon. The spindle itself is 27 grams, which means I’ve only got 17 grams of single. 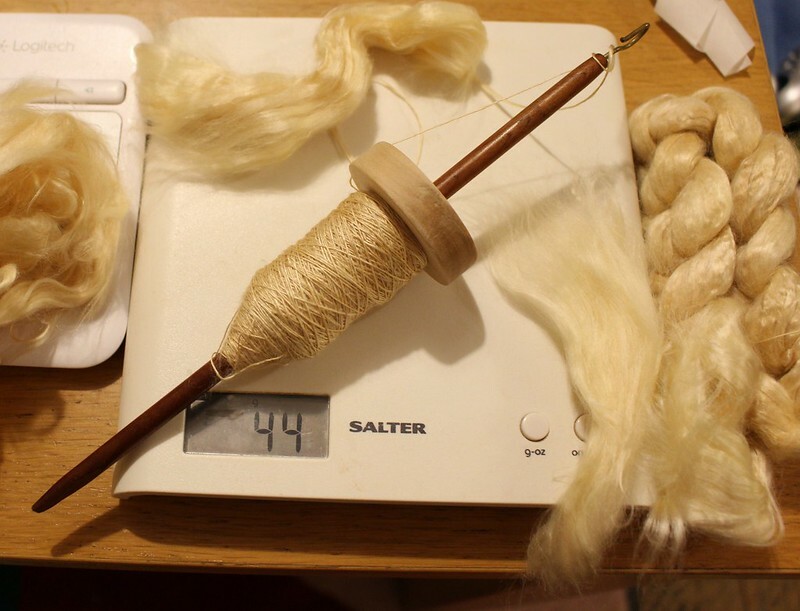 I’ve had quite a bit of waste, mainly due to inexperience with the fibre, partly due to being out of practise with my spindle, but to be honest I was expecting that. I’ll get that wound off on to a toilet roll middle as soon as I’ve completed those socks, so I can make start on the second 25 grams and hopefully end up with enough yardage to make a light scarf or something. As it is, I seem utterly unable to do the ‘ten minutes a day’ thing that is so often recommended to spindlers, mostly as I tend to find that it takes me a good five minutes to get properly back into my stride, at which point I don’t want to stop until it seems like I’m losing it again! Still, I’m going to try and make sure that the next time I pick it up I won’t be spindling for an hour and a half, as generally happens – it’s just not good for my back, I’ve got a really tendency to neglect my posture because I’m concentrating so hard on the spindling. My spinning’s still going to be playing second fiddle though, as I need to crack on with that second sock for my future brother-in-law – and with my sister’s – and the knitting for my great niece that I’m planning to have finished in time for her first birthday, which is in less than fortnight. 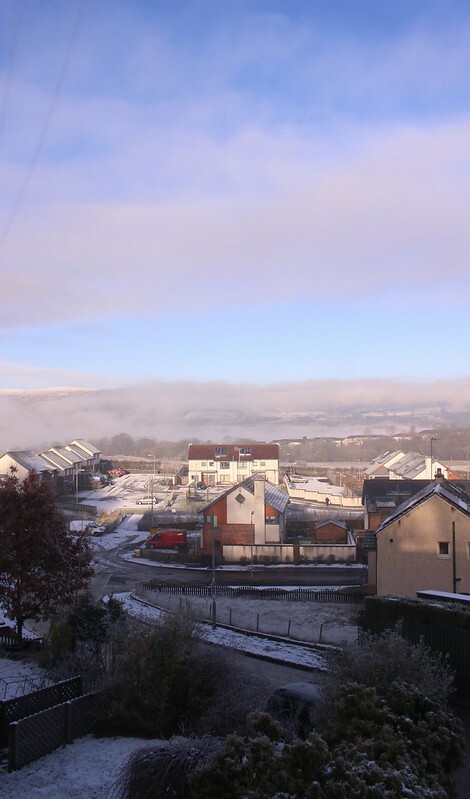 It’s probably a very good job that the ground outside is too frozen for any gardening! 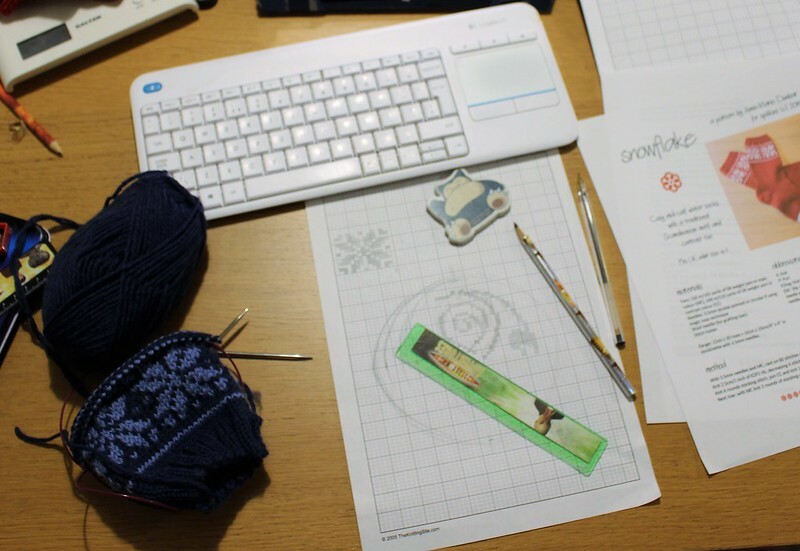 Disclaimer – non-fibre related ramblings ahead for at least half a dozen paragraphs – scroll down if you’re only here for the photos of knitting! Of all the musicians I enjoy, Kate Bush has a knack for putting her finger on the peculiar like few others; though it’s the contradictions rather than the precise sentiments of this particular song that this month brings to my own mind. December has always been an odd month, and gets no less so the older I get. It’s a month when emotions run high, and in all directions – there are times that I find myself more stressed than I’ve felt the whole year, and times when I find myself connected with a stillness that only December can summon up. It’s a month I’m immensely fond of, and yet wary of at the same time. And it’s most certainly a month of magic, being one of the few times of the year that en masse, we recreate what feel like ancient rituals, dragging bits of evergreen into our houses and feasting amongst the twinkling lights, to bring some life and light into the darkest month of the year; making wishes, and making them come true, where we can. For the last ten years, the beginning of this month has marked the anniversary of the loss of my mum. It’s not something that stops being hard on you, though the extreme rawness of that initial grief is, thankfully, something that seems less able to affect in quite the way it first did, in the years that follow; there’s something about a ten year anniversary, though, that gives you an extra knock. I always visit my dad at this time of year, and the weekend nearest to that day is always spent having our first Christmas dinner of the year. This might seem like a strange thing to do, but it always seems like a fitting way to remember my mum – she loved to feed hungry people, and she loved a celebration, and as kids, we always had a good Christmas. 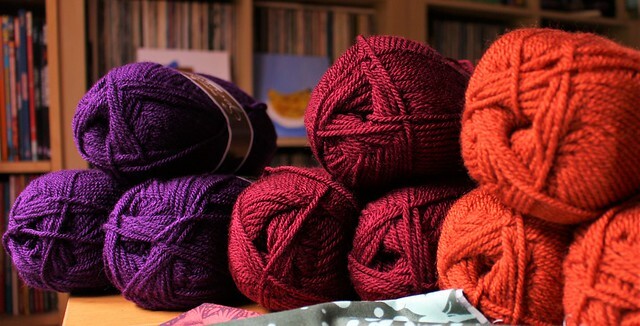 Last week I had a little catchup read of some of my favourite fibre blogs, including that of the Yarn Harlot, who lost her own mother relatively recently. Her most recent post (the day after the solstice) began with a poem by Susan Cooper, written for the Christmas Revels, a yearly tradition in some cities in the States which I’d never heard of before. Quite coincidentally, I’ve been (re)reading The Dark is Rising since the beginning of the month, a book from my childhood that has stayed with me nearly forty years (and also the reason I first decided to give one of my favourite bands, Mercury Rev, a listen – that, and the fact that they’d collaborated with members of The Band). I bought a second hand copy from ebay back in October, to read in December, the month in which the events of the book take place. It’s part of a sequence of five books that goes by the same name, and draws upon British mythology (most particularly, Arthurian legend) to tell the story of the battle between Dark and Light, for dominion over the world. It’s a far more complex series than this description might suggest, though, and once I’ve reread my favourite one I’m going to chase up the others in the series. I already own one of them (The Grey King), although I’ve not read that one for many years either – once I’ve got hold of the first, I might see if the kids want to have a bit of a read-along with me. It turns out that this time last year there was a bit of a revival instigated on Twitter (dubbed #TheDarkIsReading) and I found quite an interesting little essay on this site, which focusses on the themes of remembrance and tradition that run through the series, themes particularly associated with this time of year more than any other. I think the last paragraphs, whether or not you agree with the political analysis running through it, describe what makes the series something other than a retelling of the aforementioned legends (maybe don’t click on that link if you want to read the books without any hint of what’s to come). I’m currently less than halfway through the book, though with the dashing about and organisation involved in the run-up to the 25th over, I think I’ll have reached the end of it by Twelfth Night. I’m enjoying it immensely, it’s very much as I remember it and there’s surprising little I’ve forgotten in the intervening years. I don’t remember the details of the resolutions of the chapters, but when I’m immersed in reading them, the scenes feel very much like old, familiar surroundings. The whole thing is imbued with the spirit and the magic of Christmas, and particularly, its link to older traditions – Yule, the celebrations of the shortest day, the turning of the New Year. This latter, bookmarking the end of the December, always gives me the shivers, especially the old tradition of opening the front and back doors of the house to ‘let the New year in, and the Old year out’. As a child – particularly if I found myself sat in a line between the two doors – part of me imagined I might catch sight of a hoary old man on his way out the back door (not something I relished at the time). The singing of Auld Lang Syne also unsettled me; I think that the remembering of those that aren’t with us was something that I didn’t fully appreciate, but most of all it seemed at odds with the general revelry of the events of the evening, leading up to the chimes of Big Ben at midnight (Andy Williams on the telly, martini and lemonade all round, cheese and pineapple on sticks etc). I don’t know if getting older will necessary ease that feeling, but I’ll be continuing these traditions with my own children (though hopefully without unnerving them too much – at least one of them is as easily spooked as I was!). Along with the anticipation of Christmas Eve and the excitement of Christmas Day, I feel that’s always been the best way to remember mum at this time of year. The details of my childhood Christmasses aren’t something I can recreate, nor would I wish to (Rupert annuals and Scalextric sets notwithstanding!) – but the feeling of those Christmasses is a gift from my parents that I want to pass on. After the racing about (and several mishaps) in the run-up to the big day, our Christmas Day this year turned out to be a relaxed and happy one, which is all I could ask for – and tomorrow we have New Year’s Eve to look forward to, without the Cinzano bianco and the cheese and pineapple, most likely, but with everything else intact. 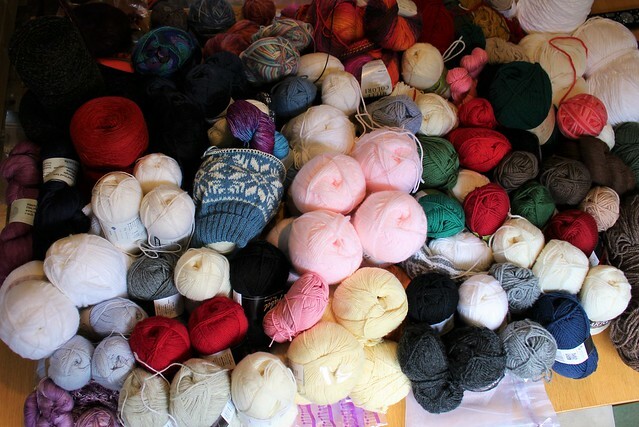 And so, onto another tradition which comforts me – and for which I have to thank my mum, and her mum – the Knitting. Where are the pictures of half finished socks, I hear you cry? I’m pleased to say that this year, I finally managed to finish my eldest’s Christmas stocking ready for Christmas Eve (albeit only with a few hours to spare). Don’t be too impressed though, as this was mostly due to having put the gifts that didn’t make the last post deadline to one side, once I knew there was no chance of getting them away in time. 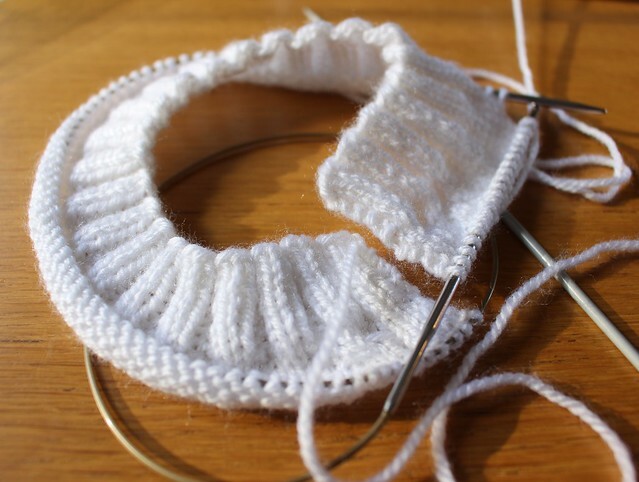 I’d been storming through the two I’d been working on – my sister in law’s yoga socks, and the Second Sock for my Sister – and feeling quite pleased with my progress. 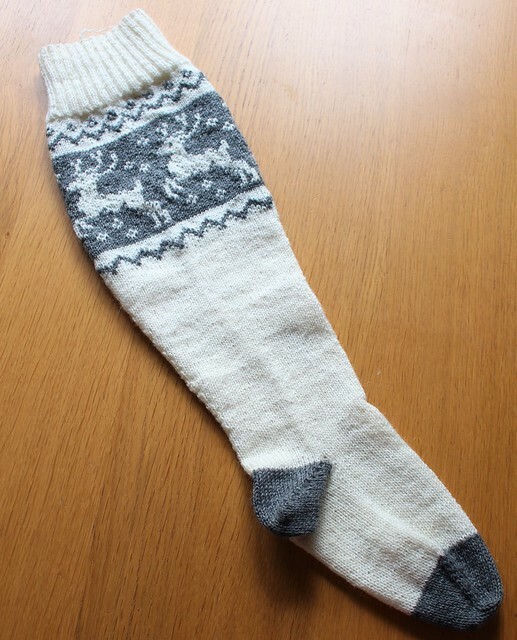 The yoga socks went well, and were posted away to Aberdeen in good time. I even remembered to take a photo, but sadly, that’s on my laptop which currently isn’t talking to anyone, so I can’t show them off. I was quite pleased with how they came out but I’m yet to find out from my sister in law if they actually fit – maybe next time I see her I’ll be able to get another pic. I was feeling good about the progress I’d made on the Oh Deer! socks, having done the most time consuming bit well in time, but as I neared the end of the panel, I started to wonder if it didn’t look a little wide. The first had seemed wide to me until I tried it on, though, so I got that out to compare the two. 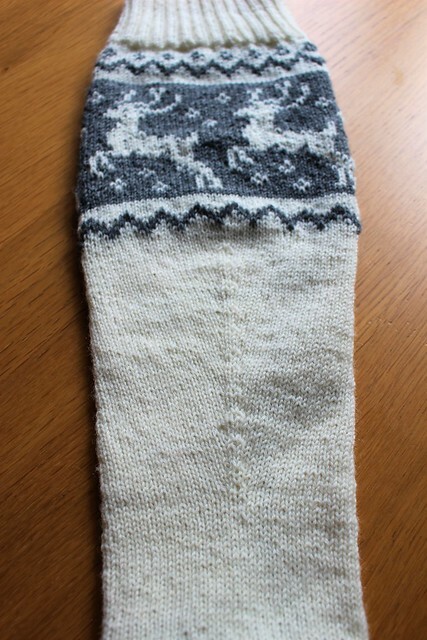 and the socks for my future brother in law, which are decidedly less done than the gloves. 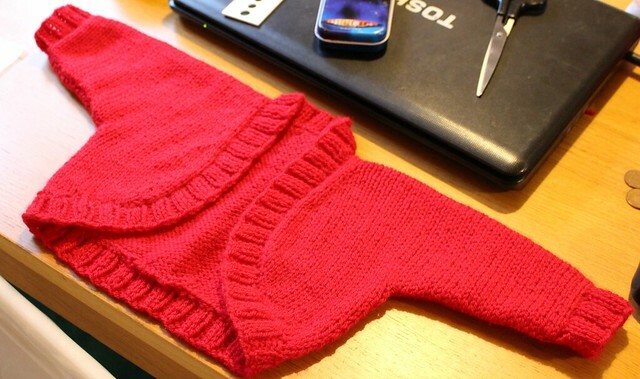 I’m hoping to have the gloves done by next week, and the socks shortly afterwards. 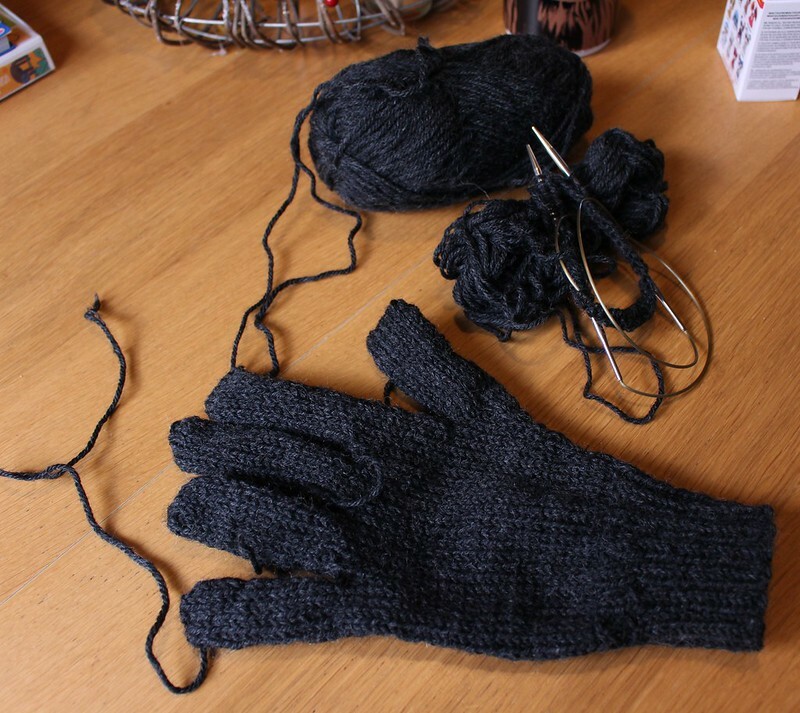 Which sounds like a lot, but the gloves are a super fast knit (that first glove took one evening and one morning), and while I’m contemplating a little bit of colourwork – possibly – for the socks, it won’t be anything complicated. This does mean that I’ll probably be able to deliver both socks and gloves in person, which isn’t a bad thing. I’ve an idea of shoe size for the socks, but I’m not 100% sure on the sizing for my uncle’s gloves, so it means that if he tries them on and the fingers turn out to be a little too big or small, I can offer to tailor them so they fit perfectly (like a glove, you might say), while I’m visiting down at my folks. I didn’t manage to get a photo of the stockings all hung in a line on the mantelpiece on Christmas Eve, because with kids that particular night is always a little hectic and excitable, and as the culmination of several weeks of shenanigans, I tend to be nothing if not exhausted by the end of it. I do, however, have a photo of them stuffed with good things, post-Christmas morning (mostly sweets, which is why my youngest’s is looking fairly depleted compared with the other two). As we’re now the other side of midwinter, the days are lengthening, not that you’d know it here just now. Here’s hoping that Christmas brought a little light into your life during this darkest of months, and sincerely wishing you all the best for the New Year! ..I might have to rationalise the number of knitted Christmas gifts I’d been considering rustling up for family members. 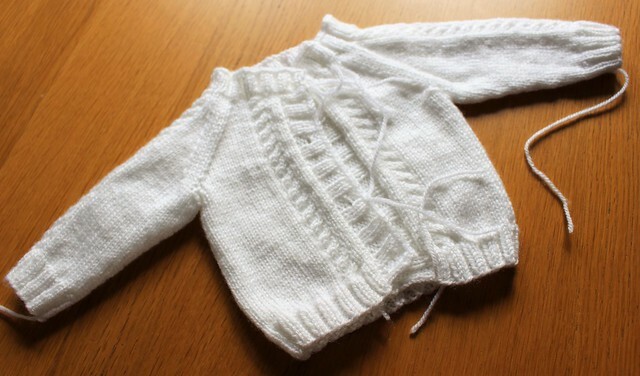 I finished off the little white baby cardigan last week, while I was down visiting in Derbyshire again, as it turned out that the little person it was destined for wasn’t interested in hanging about for his due date. He arrived a couple of days before I was due to return home, so I sewed the buttons on and delivered it to his granny, and didn’t get a photo of it in all the rush. I’m being sensible and not ordering the yarn for a couple of little knits for tiny people that I’d envisioned myself handing over, but which sadly/realistically, isn’t going to happen this side of Christmas. I’m not even certain all these projects will find their way off the needles in time, but I’m going to give it my best shot. It’s true that it’s large enough that you could probably wear some thin gloves underneath it, but as the temperatures have dropped over the last few days, that’s not something I’m currently considering a disadvantage. If I can get my Sister’s Second Sock finished up, and work through the other two projects that aren’t even cast on, and the one that is cast on but isn’t very far along, then maybe I’ll start the second mitten, otherwise I might make it an over-Christmas knit – there’s still a good few months of mitten weather left, after all! Aside from those, the dark grey Drops Karisma is hopefully going to turn into a pair of gloves for my uncle, who was lamenting that he can’t get a pair of thick woolly gloves in town that he likes and that aren’t Thinsulate lined, and the variegated blue yarn is hoping to grow up to be a pair of yoga socks for my sister in law (they’re constructed without any heels or toes, which should help my cause!). 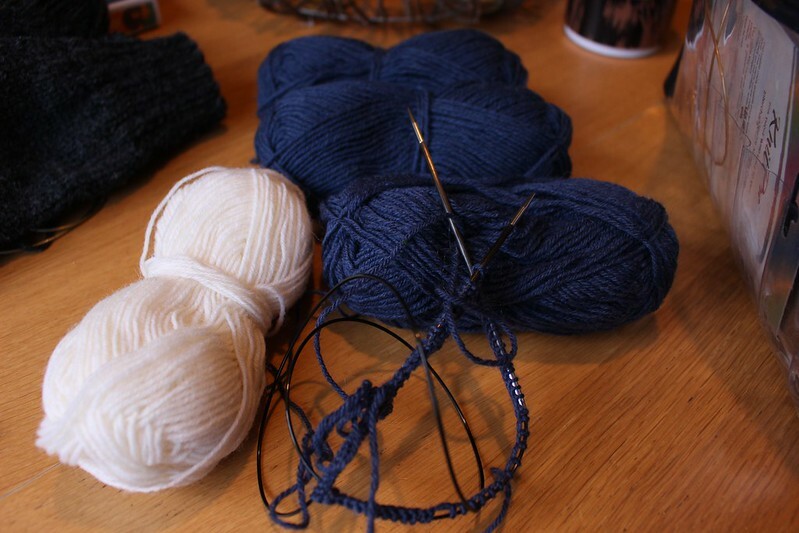 The blue and white yarn also wants to be socks, for my ex-Forces brother-in-law-to-be, in a currently undecided pattern which I need to ask my sister about, because I’m thinking about doing a white motif on them, but I’m not sure whether to go christmas or naval right now. I’m feeling relatively accomplished, because I have sort-of one and a half finished objects since I last posted. Namely, the white baby cardigan I started a couple of weeks back, and the first of the knee length socks I’m knitting for my sister. I had a few ups and downs with the cardigan – or rather, lefts and rights. 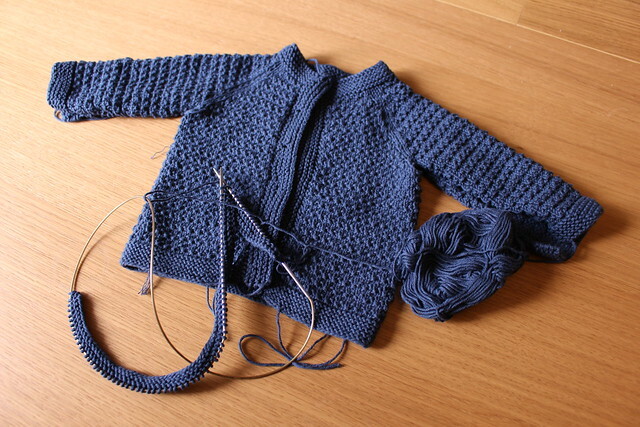 I’ve knit the body with a simple cable on each front, each cable twisting towards the button band, so it seemed sensible to knit each of the sleeves with the corresponding cable. Storming through the first in no time, I added it to the body stitches still on my circular needle to free up my DPNs. 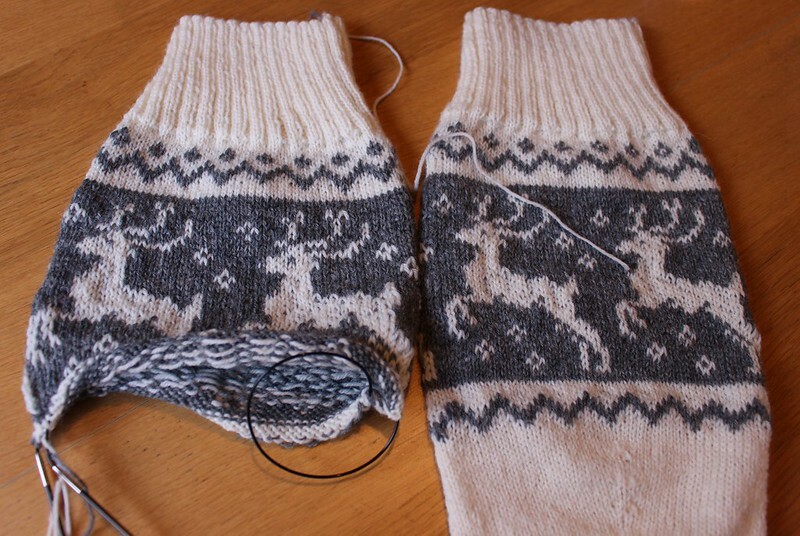 The second sleeve went really quickly too, so I added it in – it wasn’t until after I’d joined it all together and knitted three or four rows that I realised I’d done the second sleeve with the same cable as the first. Cue gnashing of teeth, and a spot of faffy frogging. 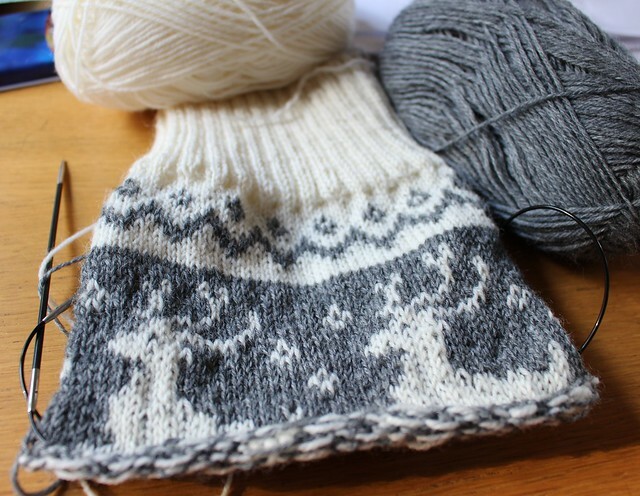 Once that was done, I have to admit I put it aside for a while and worked on the massive sock, because while picking up stitches for button bands isn’t an impossible job, I find it’s not so easy to do it while watching a bit of Kolchak or whatever as knitting a bit of stockinette sock is – even when that sock’s got four stranded deer prancing about on it. Once I’d got the other side of the stranding I picked the cardigan up again, having forgiven it for the cable incident, and decided it was going to be my ‘morning knitting’, sat at my laptop with a cup of tea after breakfast – the stranded sock somehow better suits lounging on the sofa with the chart and an oatcake and a cup of something warm, knowing I can sit for a good hour or two without feeling like I need to put it down and get on with the day. The main reason I’m knitting at the laptop at all is that I’m having massive issues with it just now. It’s getting on for seven years old, and needs some attention, if not replacing/handing on to one of the kids. Sometimes the keyboard doesn’t work properly (and this is the second keyboard it’s had, as I replaced it a good three or four years ago), and two of the keys are missing. It’s struggling with the simplest of tasks, having not coped with its last few updates terribly well, which basically means that it takes a good half hour to get its house in order after being switched on in the morning. Then, once it’s up and running and I’ve got online, as I’m clicking here and there I find myself twiddling my thumbs waiting for pages to load, particularly if they’re image heavy, or full of Flash-y nonsense. It’s been a good workhorse, and I’m not getting a new laptop any time soon, so I’m using the waiting time to knit – mostly I’m browsing patterns and yarns and whathaveyou anyway, so it doesn’t seem odd, and I remember what dial-up internet was like, so I know how to be patient. One knock-on effect of this, though, is that it takes me a long time to do anything with my photos, and consequently, to post to my blog, which isn’t ideal. 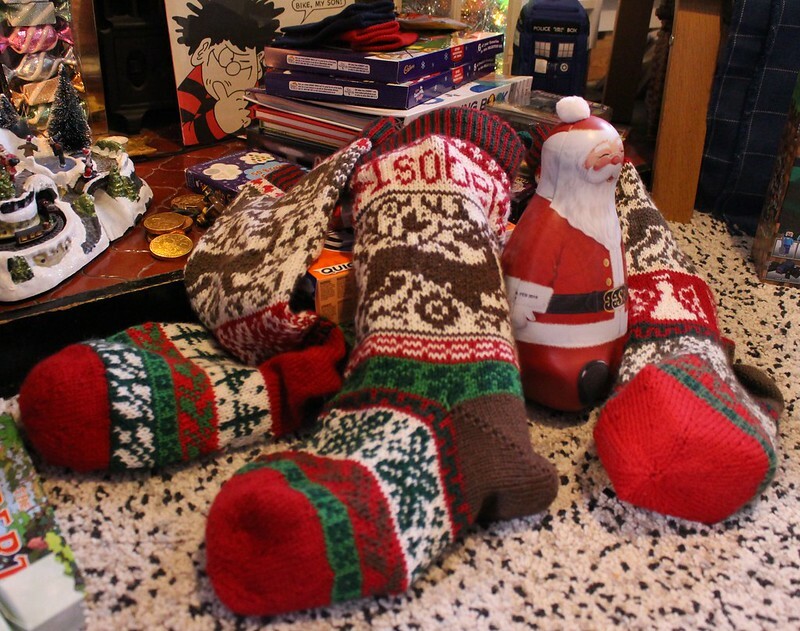 So much so, I don’t think I’ll have any trouble with second sock syndrome, and it’s putting me nicely in the mood to finish off the christmas stocking I need to get done! 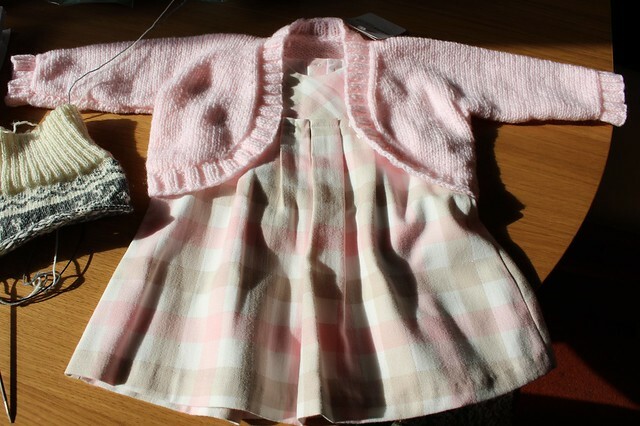 She’d also bought a little pale grey dress, flecked with bits of red, for a long-time friend’s new baby granddaughter (who I knitted a little Yoked Baby Sweater for, back in August – a pattern that’s really easy, but also really cute). 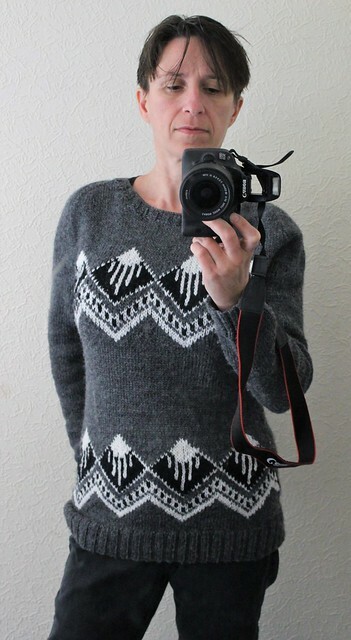 After our friend saw the photo I’d taken, she asked if I’d be able to knit one in red to go with the little grey dress. She’s always been one of those neighbours that’s like family, so I told her I was more than happy to (and honestly, it’s a fast and satisfying little knit, nice easy telly knitting), and thought I’d try and find some yarn for it while I was there. The LYS in my home town is called Dragonflies, and just so happens to be owned and run by an old school friend who – until this weekend, at least – I haven’t seen since we were at college (I’ve popped in before but managed to miss her, as her mum also works in the shop). She sells lots of crafty bits and bobs besides yarn, does clothing alterations and custom dressmaking, including wedding outfits – in fact, when I walked through the door she was sat working on a wedding dress. I wasn’t entirely surprised to discover she’d opened the shop, I’ll be honest. As a teenager, she was the only person I knew that owned a proper dressmaker’s mannequin – in fact, she’s still the only person that I know that owns one! It was lovely to see her and have a quick chat, and I’m going to make an effort to get along to one of the Knit and Natter sessions they have each week for a bit more chat (I was worried about holding up other customers that’d come in!). 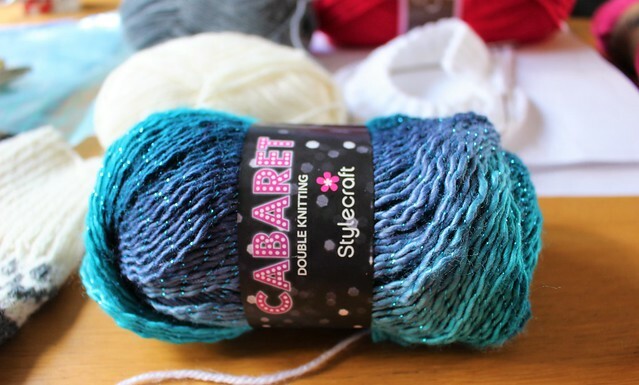 And my younger daughter Heidi bought herself a ball of their Cabaret yarn, in her favourite colours, though she’s yet to work out what she’s going to knit with it – like mother, like daughter, it seems. 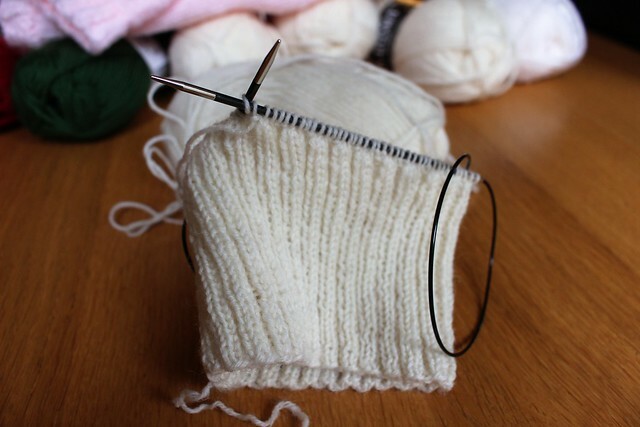 I haven’t cast on the red shrug as yet, though, because before that I’d also promised a baby knit for another grandchild of the same friend – this one isn’t due to arrive until mid-December, but with all these projects on the go, I thought I’d best crack on. 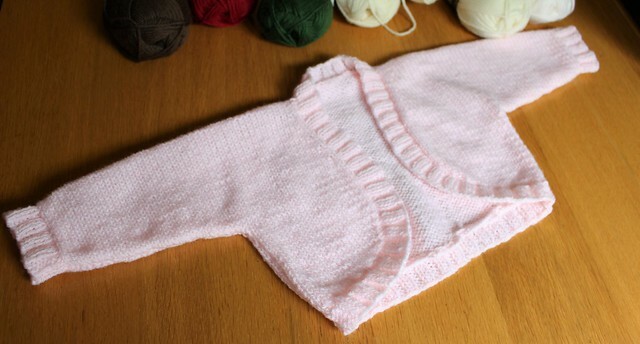 Unlike with the previous knits, this time I don’t know if I’m knitting for a girl or a boy, so I’ve gone for the classic option and decided to make a little white cardi. While I do like the Yoked Sweater, I fancied having a bit of a change – in fact, I fancied having a bit of a play. After a bit of a browse on ravelry and the Drops site for inspiration, I’ve cast on a suitable amount of stitches in some white DK acrylic from my stash, using 3mm needles to make a cosy fabric. 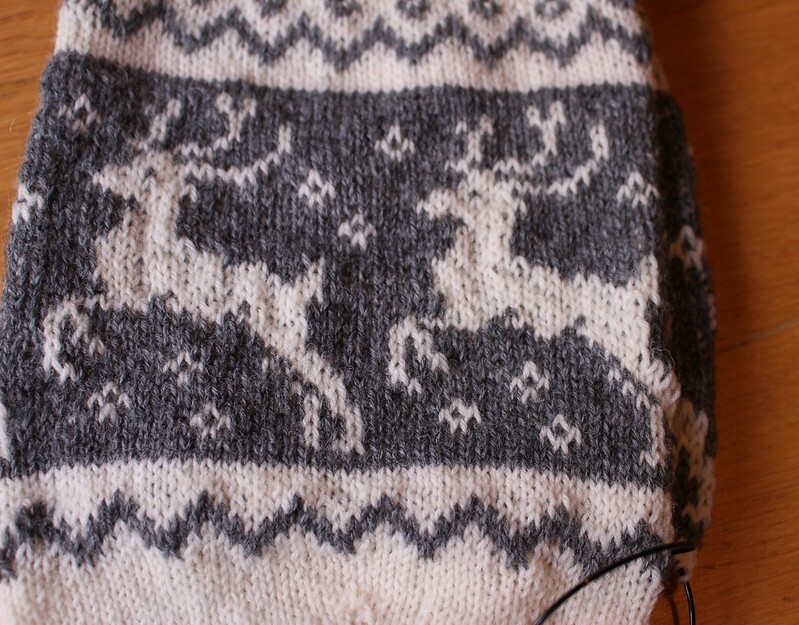 There’s a little bit of 2×2 rib, and it’s mostly stocking stitch. I’ve added a row of cabling either side of the front edges, and I’m just starting the first sleeve, which will also have a central cable section. I did consider adding little pockets but I’m having second thoughts, because baby pockets aren’t the most necessary of things! The new projects have just set me off though, because somehow I’ve ended up casting on a pair of mittens with some of the Lima I had in my stash. Next up will be the christmas knits I’m planning for my grand-niece, so I need to order some cotton yarn, and I’ve a pile of stashed Karisma that I think will possibly turn into a jumper and hat for baby R, though I need to work out the most christmassy colours – I’ve got off-white, red, green and blue (they’re colours I bought with christmas stockings in mind last year). Mum fancies a red sweater, so I might just go with white – and possibly a Santa hat to go with it! 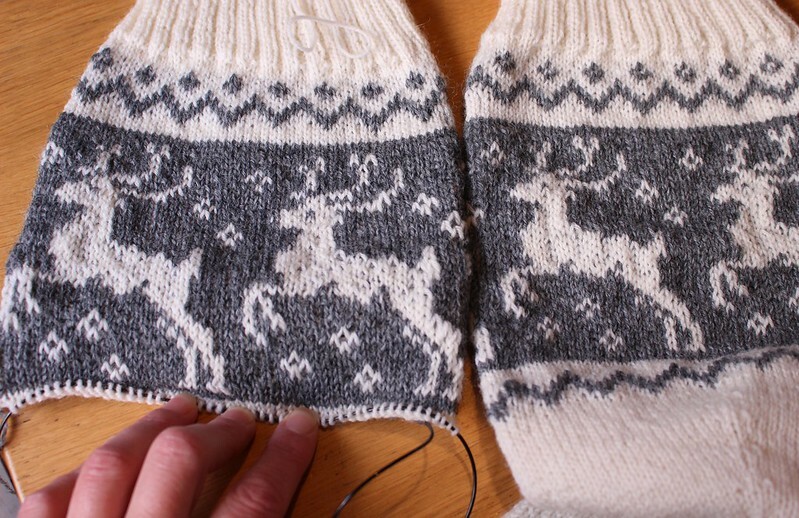 Once I get those underway, I want to knit up some other gifts for family. I did knock out a very quick chunky red hat for my youngest last week – it only took a day, I think, but isn’t quite finished because it definitely needs a pompom (I’m not taking a photo until I’ve done that). It’s not a christmas gift, just something practical to keep his little bonce warm now the weather’s cooled off – once this little list of baby knits are finished I’m going to concentrate on making something for my more immediate family, in between making some knits to list in my etsy shop. I’d like to get back into designing, too, but I think that might have to wait until after Christmas. I’ve not blogged for a couple of weeks, but I have been busy with knitting and attempts at general yarn-related housekeeping. I finished off the baby cardigan and hat just in time to deliver it before coming home (I put the buttons on while I sat chatting to baby R’s parents, so mum could choose the buttons she liked best – she went for the retro brown ones – which means I don’t have an FO photo!). I’ve also been whipping my WIPs out, and separated them from the stash. The whole lot had kind of got jumbled up together, which really didn’t help, oddly enough. That consisted of the christmas stocking for my eldest that managed to fail to make its debut last year (it’s okay, she’s twenty, she can cope), the Sarah Jane sweater, plus the beginnings of another Isabell Kraemer pattern, half a chunky sock I’d totally forgotten about, and a scarf in Kidsilk Haze (those last three being the projects that constituted the tangled mess in this post). In addition to those there’s the proper finishing of the Season 12 scarf, to make it into a 12.5/13 scarf, but that involves chopping and I need to find a Zen moment to even contemplate going there. 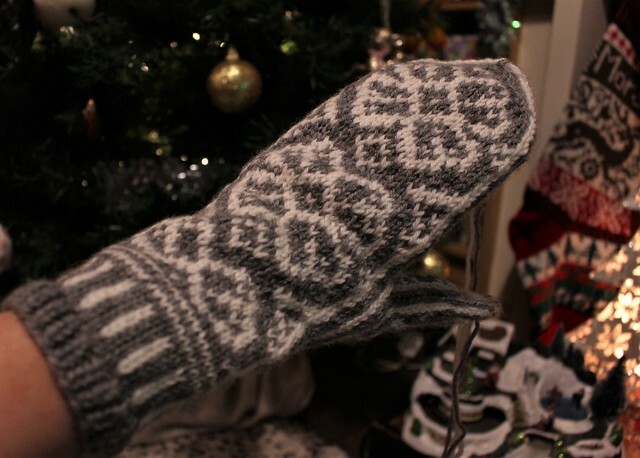 However, it’s now finished, and more importantly – it’s wearable! I’m quite happy with it overall, though were I to do it again, there’s a few things I’d do differently (including not losing a fair bit of weight between starting and finishing it). I think it needs to be a 4ply yarn for starters, because for me the detail isn’t quite fine enough in DK (I used Drops Karisma). 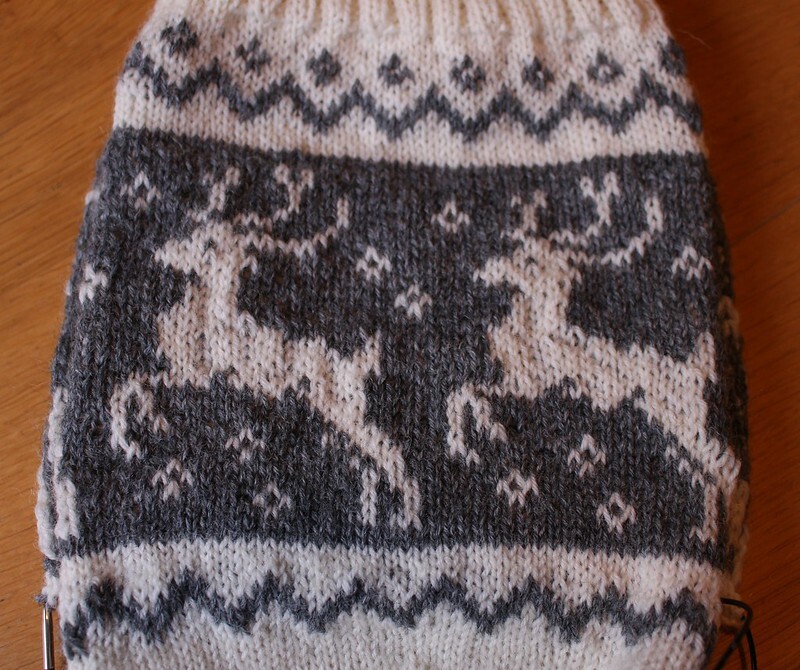 And I think, as the motif is only at the front, that I’d knit it flat. 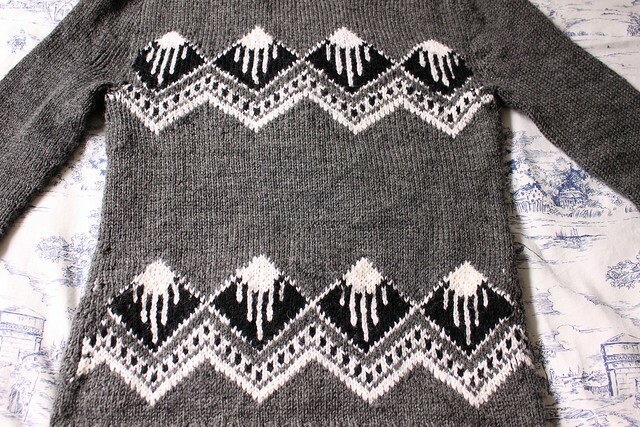 I know some would probably consider that a bit of a nightmare as it involves purling stranded, but I’ve done it before so I know I can – and I would rather do that than have the problem I’ve had with this jumper of the ends showing through from the back at either side of the motifs. Also, I did knit this before finding out about colour dominance, and two handed stranded knitting, which while this has three colours, would have helped immensely. I wouldn’t use a contiguous sleeve either, I’d probably just go for a slightly set in sleeve – raglan wouldn’t really look similar to the original, though it’d be much easier. It’d mean a little more work designing but I think the end result would be better fit-wise. All these things mean that I’m not going to bother sharing what I did to make it, as I’m not 100% happy with it, but basically, I just applied the motif to a sweater pattern that I thought would work with it, and changed the sleeves (maybe that was a mistake, and I should’ve attempted the sleeves from that pattern, because the fit around the shoulders is a little loose). I’d still knit it bottom up though, as that means the stitches aren’t upside down (the original, I think, looks to be knit the ‘right’ way up). 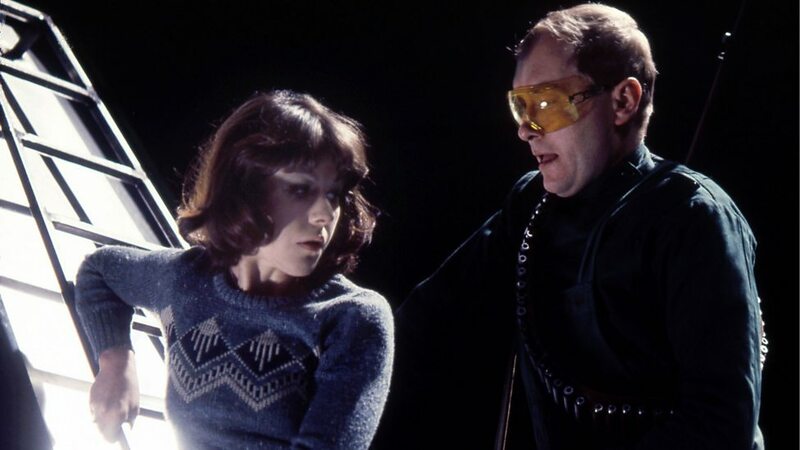 And while I love me some stranded knitting, I’m not contemplating knitting this bobby-dazzler from The Monster of Peladon any time soon (it’s sort of tempting in a crazy knitter lady kind of way, I’ll be honest). More Drops, yes, and I won’t be knitting it from my stash, but heyho. I do have a bunch of RYC Cashcotton 4ply that would probably work quite well – it’s in a pale lemon colour – but it’s very fluffy and I don’t know if it’d be too tickly (there’s angora in there, I think). I knit a cardi for my younger daughter in it a few years ago and she just couldn’t wear it, and we ended up giving it to her best friend (who was very happy with it, luckily! ), so I don’t want a repeat of that. Oddly, I don’t think it looks as bad loaded onto the dining table as it feels when it’s occupying the boxes and bags I’ve got scattered here and there around the house, but I’m finding the making up of ‘kits’ harder than I thought it would be. Deciding on a pattern is one thing, but – particularly with stranded projects – I’m finding it tricky to then complete a colourway without thinking ‘ooh, this would be nice if I just had a ball of [insert complementary other colour I don’t already own here]’, which obviously is adding to stash rather than destashing, and something I’m trying to avoid! My laptop is slowly filling up with photos of balls of yarn, and loading them all on to ravelry is going to be no mean feat. So far I’ve photographed all the DK, and added about 3 colours to ravelry, so I really need to get on with it. 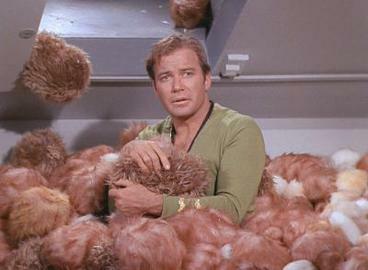 I’m mostly thankful that I don’t have to feed the yarn, too. I’ve given up trying to adjust this photo to show those colours precisely – but I’m happy with them, and think they’ll make a great S18 scarf, and for less than £20 I’m not going to be complaining if the shades are a little off. 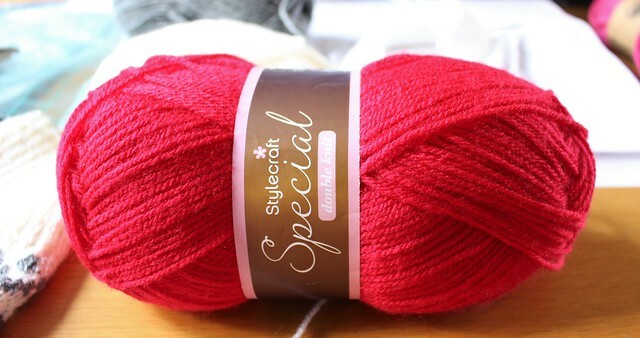 After deciding on the yarn I spent a while dithering over sock needles, but in the end that didn’t happen – instead, I ordered another 100cm interchangeable cable, and then I spotted the fabric section. I now own these beauties! I have no idea what I will make with them. 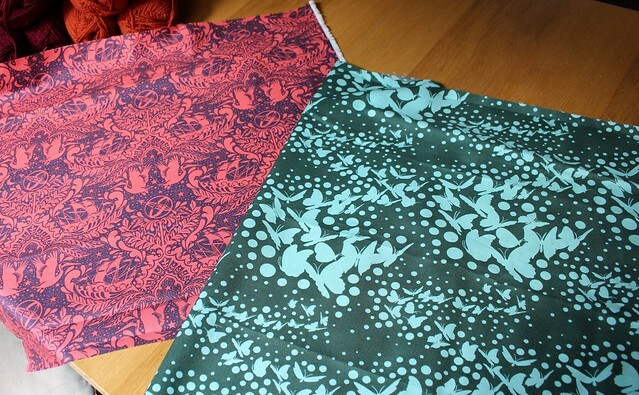 I know I was talking about needle rolls, and these are only fat quarters so that may well be all I can ultimately make, but I’m so chuffed with them – they’re as lovely as their thumbnails were on the website (the butterflies one is more green than I was expecting, but given that it’s the ‘Fern’ colourway I’m not sure what I was expecting, and either way it’s still pretty fabulous). 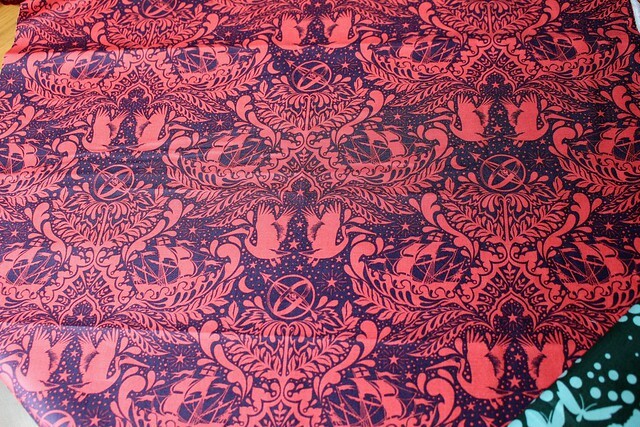 It’s also a Tula Pink design, ‘Elizabeth Ship Shape’, in Plum. And I won’t lie, I bought them because they sent me a little bit of a Lovecraft vibe. I know those are butterflies, but my brain’s thinking ‘all they ever did was clutch, and fly, and tickle’ – and the crimson sailing ships and stars just make me think of the Dreamlands. Perfect. There’s still the question of which buttons I’m going to use, too, as I bought two different sorts from Hobbycraft the other week. I like the retro brown buttons, but I’m going to see which ones R’s mum prefers before I sew anything on. 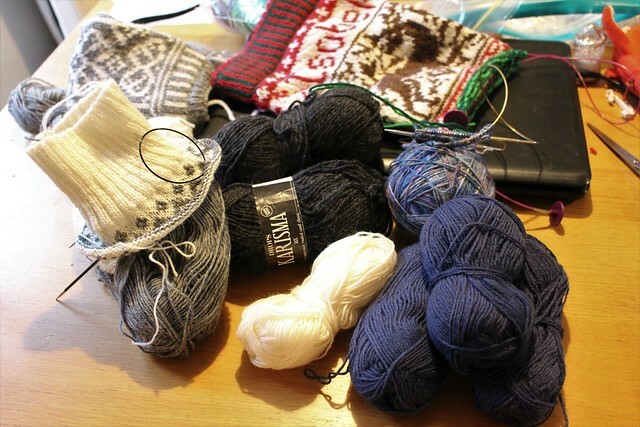 I’m hoping it should all be done and ready to hand over by this weekend – and as I’m away from home (and my stash) I’ve brought more knitting with me, in the form of the yarn for my sister’s sock. She’s going to be here in a couple of days so I might even get a chance to measure her up (we’re close, just not in an I-know-the-exact-length-of-your-lower-leg kind of way – I don’t think she’ll object because knee length socks that aren’t the right length aren’t terribly useful). And if not, I’m seeing her next weekend anyway. Hopefully I’ll remember to ask her what motif she’d like too, as the last time we spoke I seem to remember there was muttering about dolphins and/or waves (from me), but I don’t quite recall if she came to any kind of decision. I suspect I might cast on the scarf anyway, as it might provide much-needed relief from stranding when my eyes have had enough of an evening, so here’s to a couple of FOs (hopefully not from my sister, ha) and a new WIP or two by the start of next week!